Mostly cloudy skies. High around 65F. Winds light and variable..
During the April 4 regular Corydon city council meeting, Jared Chambers, President of the Wayne Community Foundation was in attendance to present a door opening opportunity for the City of Corydon. The Wayne Community Foundation is a non-profit and tax-exempt organization that receives and distributes funds used to benefit all of Wayne County and its Citizens. 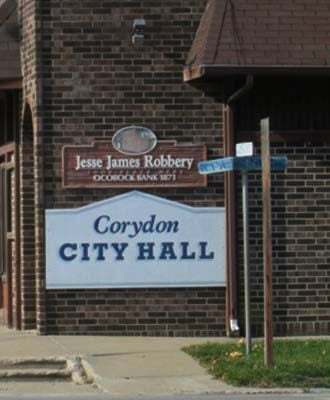 “My question to you tonight council members, would the City of Corydon be interested in filling out a request for a proposal, a RFP as everybody knows them as, for a project like this knowing there is potential funding available to pay for this comprehensive plan?” asked Chambers. “Absolutely,” said council member Eric Jaeckel. “The donor advised fund, and again this is going to remain anonymous, asked that if you agree to do this that you send the RFP’s out to engineering firms that have experience in doing this type of project,” said Chambers. “Do you have names of any firms?” asked council member Stan Rupe. “Have you put together a comprehensive plan for all of Corydon for 10-years or 15-years?” asked Chambers. “No we have to see how far our money is going on this one,” said Moorman. “That’s why I am here,” said Chambers. “We kind of have to see what it’s going to take for money to do all that,” said Moorman. “With this plan we don’t have to wonder what are we going to do, this is a professional opinion for the next step,” said council member Amber Rodgers. “It’s going to open the doors possibly again from a qualified engineering firm that specializes in these, there may be additional money that could come from this donor advised fund to begin the project,” said Chambers. Rhonda Guy, a Water and Waste Water Operator in Central Iowa was in attendance for discussion on ways she would be willing to help the city fill the position for the city’s Water and Waste Water Operator. She put together a proposal and submitted it to the city and council that included mileage and all expenses as a flat fee. If hired, emergencies would be the only hourly rate charged from the time of leaving her driveway. “Will he reconsider?” asked Jaeckel. “He didn’t talk like it,” said Moorman. Pershy will be helping the city in a short-term contract while city employee Brandon Trower attends classes and works on getting his certification needed. The city accepted the highest sealed bid of $28,240.54 received from Mike Thomas, for the building on 110 South Franklin Street that will be taken to a public hearing on Wednesday, April 17 at 7:00 p.m. Another bid was received in an email, however the advertisement requested bids be received by sealed mailed bids or hand delivered to City Hall, making that bid non-valid. A sealed bid from Shawn’s Lawns was approved for $1,104.66 for outside improvements to the Community Building at Walden Park. Larry Wilkinson was in attendance to thank Mayor Moorman and the council for their work with I.T.C. over the power cables not being moved now into the residential area. The council approved resolutions 2019-11 through 2019-15 approving Hall Engineering’s Agreements for work within the city. These resolutions include the water main replacement projects on South DeKalb Street from West Marion Street to West Madison Street, DeKalb Street to South West Street north of elementary school and West Marion Street from South DeKalb Street to South West Street. Also included is the sanitary sewer system rehabilitation project on West Monroe relining and manhole rehabilitation and addendum for additional locations to project street improvements for 2019. The council approved a contract with Jeff Ellis & Associates, Inc for 2019 services for the Prairie Trails Aquatic Center and a resolution to set a rate for a city employee to catch and deliver dogs to the Corydon Vet Clinic. A tax abatement was also approved for Legacy & Investments LLC for their commercial building. The next City of Corydon meeting is scheduled for Wednesday, April 17 at 7 p.m. with a work session on Wednesday, April 10 at 7 p.m.